Looking for a wedding band that is extraordinary? You have come to the right place. Our 7.5mm men’s glass finish 18k white gold wedding ring is the ideal solution for any modern man that prefers precious metals. 18k white gold contains 75 percent pure gold and an alloy of zinc, palladium, silver, or nickel for added durability and quality to last decades or centuries as an heirloom. This stunning wedding ring features a glass finish center cut by intricate rope details. The comfort-fit band is made using a little extra white gold metal to create a slightly domed profile. Comfort-fit bands such as this are ideal for men with large knuckles who work with their hands all day. White gold is highly malleable and can be cut or reshaped in the event of finger swelling, injury, or another emergency. Make the smart yet sophisticated choice today! 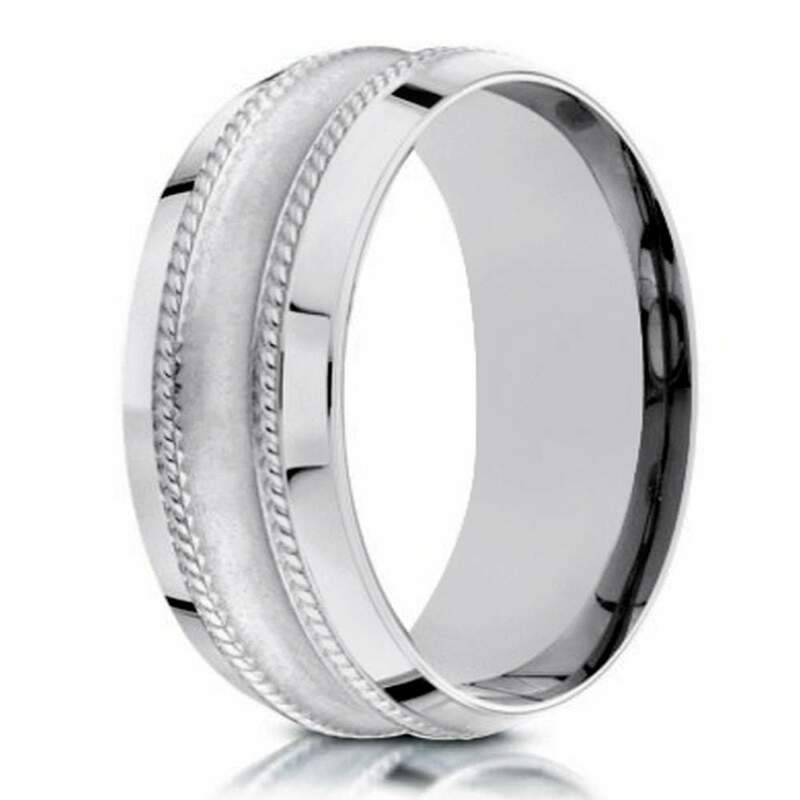 Our 7.5mm men’s glass finish 18k white gold wedding ring placed a modern twist on a traditional classic. Best of all, white gold can complement any type of skin tone or personal sense of style. The sterling hue looks especially great when set against grayscale wardrobes. Looking for a timeless wedding ring to make the happiest day of your life that much more special? Look no further. Our designer wedding ring is sure to delight the blushing bride and draw the best kind of attention. If you have any questions about our selection or need help finding the right ring for you and your lifestyle, please contact us today for further assistance.